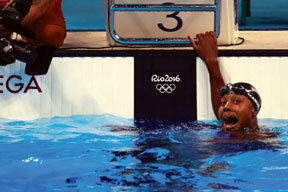 Simone Manuel checks the clock after winning a gold medal in the 100-meter freestyle. RIO DE JANEIRO, BRAZIL — Simone Manuel managed to make history and break a record, all in less than a minute. Manuel became the first African American woman to win an individual event in Olympic swimming on Aug. 11, 2016. She and Penny Oleksiak of Canada tied for the fastest time, an Olympic record in the women’s 100-meter freestyle: 52.70 seconds. Manuel is sharing a room with another record-setting American swimmer, Katie Ledecky, in the athletes’ village here. She and Oleksiak shaved 0.01 seconds off the Olympic standard of 52.71, set earlier in the Rio Games meet by Australia’s Cate Campbell. Sweden’s Sarah Sjostrom won the bronze in 52.99.